Aspire Tigon Kit is the brand new vape pen style starter kit, which is built-in childproof safety function with a portable size. 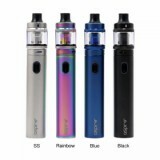 Aspire Tigon Kit is the brand new vape pen style starter kit, which is built-in childproof safety function with a portable size. Aspire Tigon vape starter kit is powered by a large 2600mAh built-in battery and works in Bypass output mode. Tigon Aspire comes with a “stick” portable design measured 142mm by 24.5mm. It is charged via micro USB with max charge current up to 2A. Paired with new Aspire Tigon Tank, it comes with 3.5ml e-juice capacity for standard version and 2ml for TPD version. Tigon Tank adopts push fit replacement coils with a 0.4Ω and 1.2Ω coil resistance for both MTL and DL flavors. • You can check other pen style kit in BuyBest. Best product out there I really really loved this its so handy and small I love its size . Looks amazing and performs even better. Super happy with this purchase. 새로운 바라는 것 tigon 탱크, 그것은 3.5ml e-juice 능력, 표준 버전 2 2 버전 위해.tigon 탱크 밀어 대체 코일 통해 잘 0.4 Ω, 1.2 Ω 코일 저항 선, 모두 dl 맛.
Tigon Aspire comes with a “stick” portable design measured 142mm by 24.5mm. It is charged via micro USB with max charge current up to 2A.